The Tulip has a narrow stem and a large bulbous bud at the top, just like the flower that it is named after. 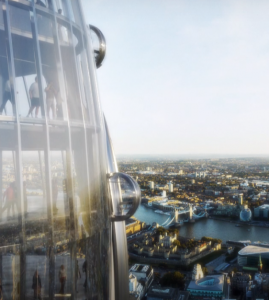 It is also a glass-clad structure, like the Pickle. One of the most unusual details about the structure is the plan to have small pods – the bubbles which ride along the outside of the bud at the top, offering an incredible view for visitors. It looks like the future as was featured in “The Jetsons“, an old cartoon about the future. On this page, Atlas Obscura, you can find a whole bunch of buildings that look like animals, including cats, dogs, elephants, fish and a number of whales. Are there other buildings that look like things in nature? Can you make a list? If so, please send them to us at archkidecture and we can make a page filled with your ideas. 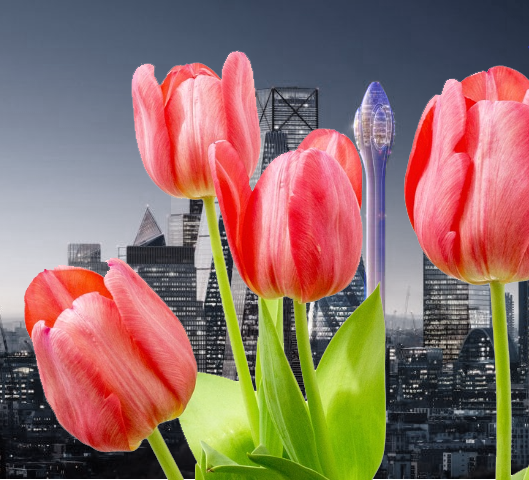 It would be an interesting addition to the London skyline but there are some folks who are suggesting that the Tulip should not be built because it may cause problems for the local airport’s radar system. The renderings of the building are from the architects website and are created by DBOX for Foster + Partners. If you want to know more about the Tulip, this article on DeZeen is very helpful. In fact, there is a lot of interesting news on DeZeen if you want to know more about the built environment. Go to the architectural firm’s website and see a video of the Tulip – it is otherworldly.